A film whose 48 second running time belies the depth of thought sparked by the connotations of its situation, jimmies by Jonah Primiano – who previously brought us late night ennui short IDLE – calls out a common New England ice cream topping with an uncanny name and the oblivious patrons enjoying this tasty treat. I caught up with Jonah to learn more about his first iPad animation project and his thoughts on the enduring power of words to victimise. jimmies is your first foray into iPad animation, what app did you use and how did working in this way influence the film’s style as compared to your previous work. For this piece, I used the iPad app FlipaClip. There are a few different animation apps out there, but I found that the workspace and features in FlipaClip were the most useful. The app allowed me to work essentially the same way I do when working on paper, the only drawback is the inevitable ‘digital’ look of the brush tool. Additionally, since I decided to only work in the app I didn’t have the compositing possibilities that I do in After Effects. Those two elements definitely shaped the overall look of the short. Did you experience any speed gains/impediments working this way? Working on the iPad was very liberating actually. I feel that starting to animate traditionally can be a very cumbersome process and because of that, it can be hard to be spontaneous. Having the ability to open this app and just start animating really freed me up to make something that was on my mind and not stress about the process so much. As I mentioned previously, the only thing that really held me up was the brush tools in the app. They are pretty basic and don’t yield a very polished look. Starting to animate traditionally can be a very cumbersome process and because of that, it can be hard to be spontaneous. Do you see yourself creating more iPad-based animations in the future? I plan to make more work this way for sure. It was a really positive experience and allowed me to essentially quickly sketch an animated idea. The next time around I plan to spend a bit more time on the final visual look and play with some of FlipaClip’s other features to see what I can come up with. I also think working this way could become my first step in a longer film project. I can see myself fleshing out a lot of movement on the iPad and then bringing it over to PSD or even tracing the frames onto paper to create a final polished look with better brushes, etc. What are your thoughts on how different audiences may experience the film given the regional specific connotations of the term “jimmies”. My intent was for the audience to be curious about the title and tagline in context to the rest of the film and to do a little research of their own. If this were a longer project that I was expecting to play at a festival or something I may have made it more explicit. I’m a fan of films with layered meaning that doesn’t mean less if someone doesn’t pick up on all of those layers on their first viewing though. 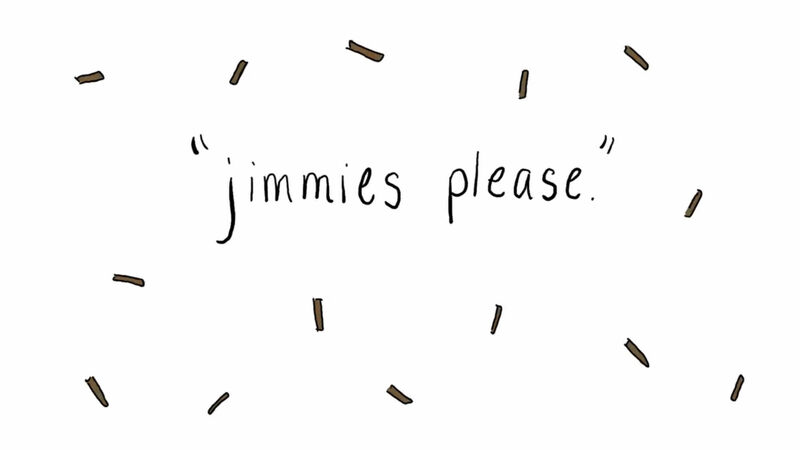 The use of “jimmies” to describe chocolate sprinkles in the New England area is, to me, a perfect example of ingrained racism in American culture. 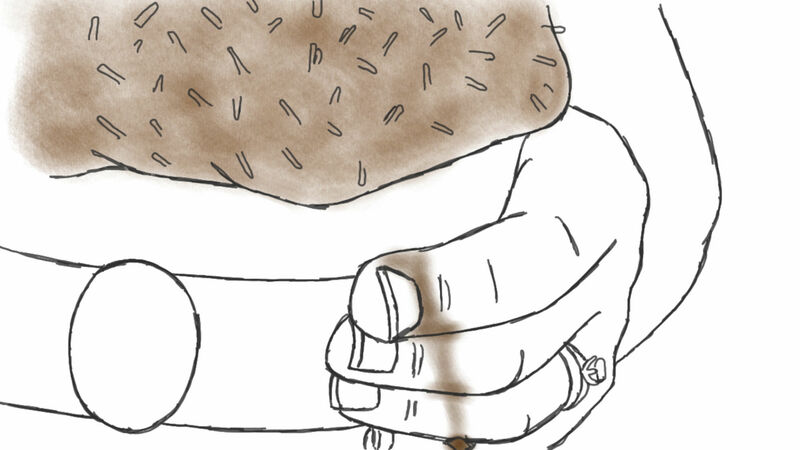 Regardless of the ‘true’ origin of the term, it is impossible to look past its usage as a way to describe only brown sprinkles during a time in the United States where the racial divide was apparent and accepted. It was especially obvious on that day when I noticed that everyone there was white and didn’t have to consider the implications of the term. With that in mind, it felt all too fitting to overhear the conversation depicted in the film coming from a group of all white patrons who inevitably had ordered ‘jimmies’ on their ice cream. The term and the conversation mirrored each other in their willingness to look past the racial undertones of both.